This was originally posted at International Liberty. The follow-up, “Now the White House Wants to Raise Taxes without Congressional Approval!?! ?” will be posted here tomorrow. On the issue of so-called progressive taxation, our left-wing friends have conflicting goals. Some of them want to maximize tax revenue in order to finance ever-bigger government. But others are much more motivated by a desire to punish success. They want high tax rates on the “rich” even if the government collects less revenue. Some of them simply pretend there isn’t a conflict, as you might imagine. They childishly assert that the Laffer Curve doesn’t exist and that upper-income taxpayers are fiscal pinatas, capable of generating never-ending amounts of tax revenue. 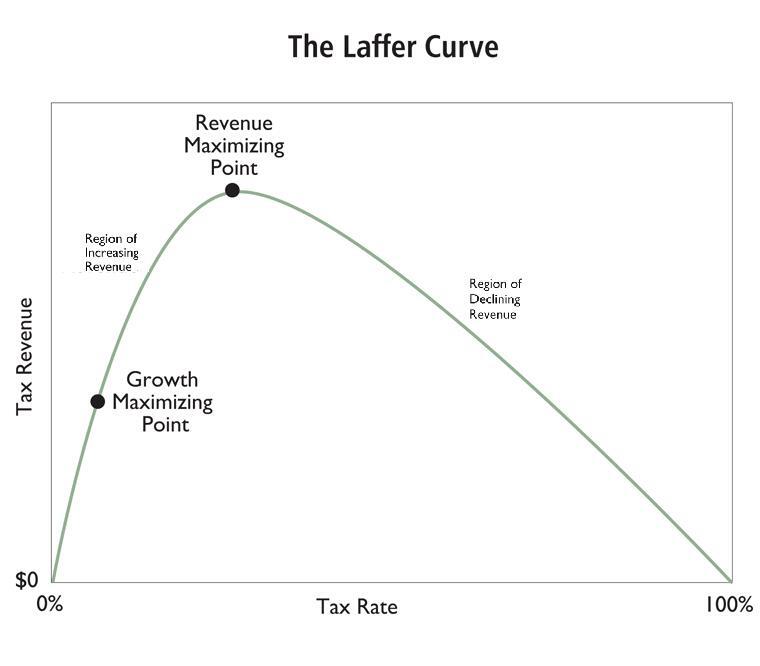 But more rational leftists admit that the Laffer Curve is real. They may argue that the revenue-maximizing rate is up around 70 percent, which is grossly inconsistent with the evidence from the 1980s, but at least they understand that successful taxpayers can and do respond when tax rates increase. So the question for grown-up leftists is simple: What’s the answer if they have to choose between collecting more revenue and punishing the rich with class-warfare taxation? The recent massive expansion of public debt around the world during the Great Recession raises the question how much debt a government can maximally service by raising the level of taxes. Or, to phrase this classic public finance question differently, how much additional tax revenue can the government generate by increasing income taxes? And since they’re part of the real world (unlike, say, the Joint Committee on Taxation or the Obama Administration), they recognize that higher tax rates impose costs on the economy that lead to feedback effects on tax revenue. Our research (Holter et al. 2014) investigates how tax progressivity and household heterogeneity impacts the Laffer curve. We argue that a more progressive labour income tax schedule significantly reduces the maximal amount of tax revenues a government can raise…under progressive taxes heterogeneous workers will face different average and marginal tax rates. …the answer to our question is closely connected to the individual (and then properly aggregated) response of labour supply to taxes. The microeconometric literature, as surveyed e.g. by Keane (2011), has found that both the intensive and extensive margins of labour supply (the latter especially for women), life-cycle considerations, and human capital accumulation are important determinants of these individual responses. …households make a consumption–savings choice and decide on whether or not to participate in the labour market (the extensive margin), how many hours to work conditional on participation (the intensive margin), and thus how much labour market experience to accumulate (which in turn partially determines future earnings capacities). The above passage has a bit of economic jargon, but it’s simply saying that taxpayers respond to incentives. 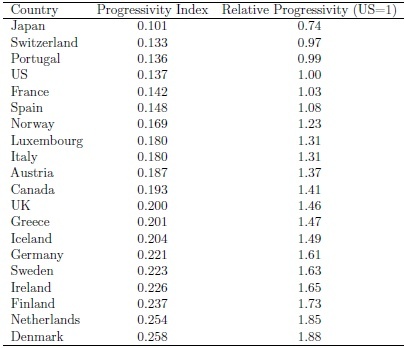 They also provide estimates of tax progressivity for various developed nations. They’re only looking at the personal income tax, so these numbers don’t include, for instance, the heavy burden of the value-added tax on low-income people in Europe. The good news (at least relatively speaking) is that the American income tax is not as punitive as it is in many other nations. But the key thing to consider, at least in the context of this new research, is the degree to which so-called progressivity comes with a high price. Here is some additional analysis from their research. Why does the degree of tax progressivity matter for the government’s ability to generate labour income tax revenues…? changes in tax progressivity typically affects hours worked…increasing tax progressivity induces differential income and substitution effects on the workers in different parts of the earnings distribution. …a more progressive tax system may disproportionately reduce labour supply for high earners and lead to a reduction in tax revenue. …more progressive taxes will reduce the incentives for young agents to accumulate labour market experience and become high (and thus more highly taxed) earners. Now let’s look at some of the results. Remarkably, they find that the best way of maximizing revenue is to minimize the economic damage of the tax system. And that means…drum roll, please…a flat tax. For its current choice of progressivity (the green line), the US can sustain a debt burden of about 330% of its benchmark GDP, by increasing the average tax rate to about 42%. Thus, according to our findings the US is currently still nowhere close to its maximally sustainable debt levels…we also observe that larger public debt can be sustained with a less progressive tax system. Converting to a flat tax system (the black line) increases the maximum sustainable debt to more than 350% of benchmark GDP, whereas adopting Danish tax progressivity lowers it to less than 250% of benchmark GDP. Here are a couple of charts from their study, both of which underscore that punitive tax rates are very counterproductive, assuming the goal is to either maximize revenue or to sustain a larger public sector. Notice that if you want to punish “the rich” and impose Danish-type levels of progressivity (the dashed line), you’ll get less revenue and won’t be able to sustain as much debt. Now let’s shift from discussing intellectual quandaries for the left and talk about challenges for believers in limited government. We like a flat tax because it treats people equally and it raises revenue in a relatively non-destructive manner. But because it is an “efficient” form of taxation, it’s also an “efficient” way to generate revenues to finance bigger government. Indeed, this was one of the findings in a 1998 study by Professors Gary Becker and Casey Mulligan. So does this mean that instead of supporting a flat tax, we should a loophole-riddled system based on high tax rates solely because that system will be so inefficient that it won’t generate revenue? Of course not. At the risk of stating the obvious, this is why my work on fundamental tax reform is intertwined with my work on constitutional and legal mechanisms to limit the size and scope of government. And it’s also why Obama’s class-warfare approach is so perversely destructive. If you think I’m exaggerating, watch this video – especially beginning about the 4:30 mark.